In a pedestrian area typical of Collioure, this small very comfortable air-conditioned fisherman’s house carefully renovated in 2011 sleeps 2 and will seduce you with its flowered environment. East-exposed living room with wall-mounted television, DVD player, hi-fi system, leather sofa, French window with 2 m² balcony, table, 2 chairs and views of the sea and Saint-Vincent Chapel. The West-exposed dining area overlooks a very sunny, quiet and flowered street and is equipped with a table and 4 chairs. The kitchen is very well fitted: induction, hob, oven, microwave, espresso machine, dishwasher, refrigerator, extractor hood, squeezer, toaster, blender, many storage cupboards for crockery and kitchen utensils. Indoor stairs lead to the ground floor where there is a bedroom with French window, balcony with sea view, 2x90 cm beds, bedside tables and lamps, cupboards, wall-mounted television, etc. The shower room is separated, accessible from the corridor and equipped with walk-in shower, vanity unit, wall-mounted toilet and controlled mechanical ventilation. The house has a laundry room with washing machine, tumble dryer, iron, ironing board, sink and storage spaces. The house is the property of the family for several generations. We renovated it without altering it. All our childhood memories are there: return from grape-harvest, storms, East winds, festive family meals in August, etc. Relaxing views, quiet and coloured street, changing horizon during the day, the sea is a permanent spectacle whether it is calm or raging when there are East winds. Shower room with walk-in shower, modern fittings, wall-mounted toilet, vanity unit, stone shelves, light thanks to charming small arched window and light strip lamp above the washbasin. Controlled mechanical ventilation and heater/heated towel rail. Salt, pepper, sugar, flour, tea, herbal tea, coffee, some espresso capsules, oil, vinegar, etc. Wi-Fi Internet access and wireless phone (conditions of use of supplier) 2 beach towels provided House linen provided for 2 persons: € 30 included in the rate Final cleaning: € 50 included in the rate Garage located in the district of the train station, around 600 m from the house. We really enjoyed our stay at Renee’s beautifully restored house in Collioure. Walking distance to the old town affords the opportunity for an extra glass of wine or two. Bonjour, tout est fait pour que le séjour dans la location soit agréable et je vous remercie d'avoir pris le temps de noter vos impressions positives sur la maison et le vieux quartier qui garde son authenticité avec ses maisons aux ouvertures anciennes parfois peu accueillantes.cordialement. I couldn’t imagine a better place to stay in Collioure than in Mme Barre’s renovated fisherman’s cottage in Collioure. The cottage is built on two levels with spectacular views of the sea from both. There is a third level below that functions as a well laid out laundry room. We were warmly greeted by Mme Barre who showed us around her lovely place, took us to the garage and then introduced us to the town. The place itself is spotlessly clean and provides everything you would want to have in your own home...including some very comfortable and much appreciated bath robes! The place is also perfectly located as it is a short walk to town yet the neighbourhood is quiet and peaceful. We would highly recommend this place as a place to stay in Collioure and look forward to doing so ourselves in the future. Je vous remercie pour cette chaleureuse appréciation , c'est avec grand plaisir que je vous accueillerais a nouveau dans cette petite maison .bien cordialement. We absolutely LOVED our time in Renée’s pretty house in Collioure! It is in a perfect location, very calm and quiet yet so close to everything in the prettiest part of town. 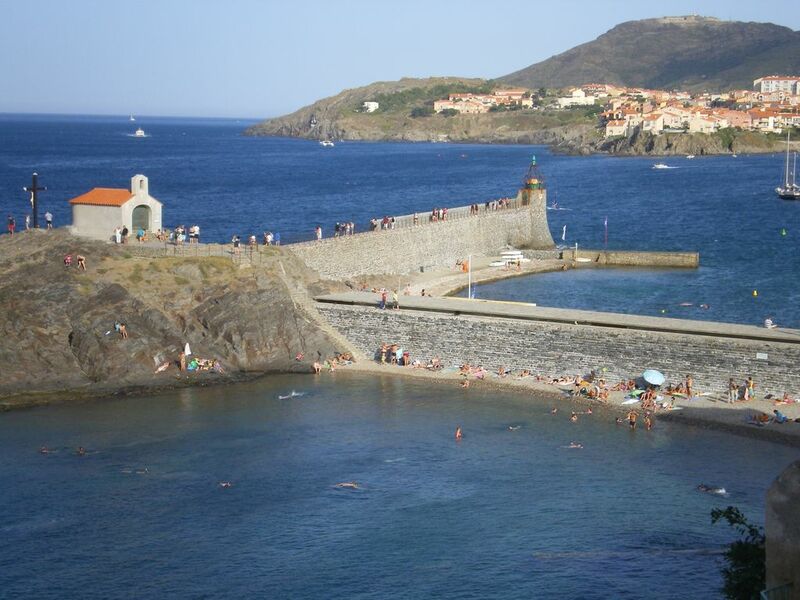 We would never want to stay anywhere else in Collioure. It is the best location on a very quaint pedestrian street. Being right on the sea is so beautiful, and the sunrises are amazing! The view is beautiful and peaceful, always with a nice breeze. The house is in perfect condition, and Renée was a gracious hostess, showing us all the best of Collioure - the boulangerie, the restaurants, helping us with arrangements for the Fête de Saint Vincent. Notre séjour là était fantastique. The people in Collioure are really friendly, so much to do, just a great place. We would love to come back and stay here. This is a unique apartment, at the edge of a cliff facing the sea, and on one of the quietest and prettiest lanes in all of Collioure. The apartment is equipped and decorated to a high standard. It is very clean, and the bed linen and towels were excellent. It was highly enjoyable to have breakfast on the balcony, and to listen to the waves in bed at night. Access to a garage is an added bonus. Je vous remercie pour la description positive de la maison et de son environnement et pour votre chaleureux commentaire.Cordialement, Renée. THIS WAS OUR SECOND STAY AT THIS PROPERTY. WE WERE NOT DISAPPOINTED. YOU WOULD BE HARD PRESSED TO FIND A MORE SPECTACULAR LOCATION ANYWHERE. THE APARTMENT HAS EVERYTHING YOU COULD POSSIBLY NEED. THE NEIGHBOURHOOD IS A TOURIST HOT SPOT FOR PHOTO BUFFS. WE COULD NOT RECOMMEND THIS PROPERTY MORE HIGHLY.IF YOU LIKE TO HAVE THE OCEAN AT YOUR FEET COMBINED WITH PRIVACY THEN THIS IS FOR YOU. PAM & GRAHAME OCTOBER 2017. This small fully renovated well fitted fisherman’s house facing the sea is in a street of the quiet district Le Mouret. The historical district Le Mouret which is 100 m from the town centre and shops and 5 minutes from the Boramar Beach has preserved the charm of the old fishermen’s houses. le tarif s'entend toutes charges comprises.la taxe de séjour est à la charge du locataire : 2.47 jour/personne . Tarif dégressif pour un séjour de 2 , 3, 4 semaines. sont compris dans le prix : le linge de lit et de toilette, la wifi, le ménage de fin de séjour. un garage est mis à la disposition du locataire,il est situé à 600 m de la maison.